** Kudos to Doug Ross for discovering this devastating news. Although we didn’t hear much about this, Osama Bin Laden’s driver Salim Hamdan blamed the weak actions of the Clinton Administration for emboldening Osama Bin Laden according to testimony this past week during his trial. Could you even imagine the headlines if Hamdan would have spoken out against Bush? 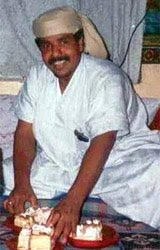 Osama’s driver Salim Hamdan in an earlier photo. Osama bin Laden’s driver told a pair of FBI agents that it was America’s fault that the al Qaida leader was alive – that Bill Clinon’s weak response emboldened Osama Bin Laden. The message was, “You had these opportunities, America. You didn’t do anything,” FBI agent George Crouch Jr. testified Friday at Salim Hamdan’s war crimes trial. The United States could have killed bin Laden in Khartoum, Sudan, before he moved to Afghanistan in 1996, Hamdan told his interrogators. They could have killed him after al Qaida’s 1998 twin bombings at the U.S. Embassy bombings in Kenya and Tanzania. Or after the October 2000 suicide bombing of the USS Cole, at the port of Aden in Yemen, which left 17 U.S. sailors dead. Instead, “Bin Laden was emboldened.” So he struck with the Sept. 11, 2001, attacks, leaving nearly 3,000 dead. We experienced the Americans through our brothers who went into combat against them in Somalia, for example. We found they had no power worthy of mention. There was a huge aura over America — the United States — that terrified people even before they entered combat. Our brothers who were here in Afghanistan tested them, and together with some of the mujahedeen in Somalia, God granted them victory. America exited dragging its tails in failure, defeat, and ruin, caring for nothing. And, just think… Barack Obama is even weaker than Clinton’s wife on national security!